Jordan from Cyprus Tours and Holiday Packages. Visit Petra from Cyprus. Jordan holiday trips and packages from Larnaca, Cyprus. Visit Jordan's amazing Petra with our affordable custom private three day or longer tours. Jordan is a land of unique beauty and hospitality that is easily accessible from Cyprus with direct flights between Larnaca and Amman. Amman, the capital of The Hashemite Kingdom of Jordan is a city of so many contrasts. See the old and the new ways living side by side. You can stroll at the Souk (Arabic market) in the heart of the Amman and within minutes find yourself sunbathing in the pool of an ultra modern hotel. Petra, a World Heritage site also voted as one of the seven wonders of the world, is the reason that most people visit Jordan. Travelling there is indeed an experience of a lifetime, as time has done little to alter the beauty and magnificence of this place. 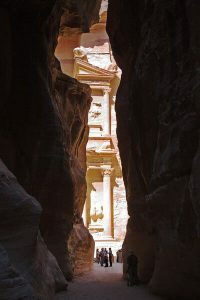 Hidden by the human eye while within the Petra gorge, the Treasury is a spectacle that no words or pictures can really prepare you for as its view emerges from the rock lined pathway that leads to it. We at Varianos Travel were one of the first travel agencies in Cyprus to organize tours to Jordan and our experience shows in all of our packaged tours. We offer special treats for our clients as a desert sunset jeep safari followed by a traditional Bedouin dinner in the Wadi Rum (where Lawrence of Arabia was filmed). We also recommend visits to the Dead Sea, Jerash, which is the best-preserved Greco Roman city in the world and Aqaba for scuba dive lovers. We like to think that our packages make excellent sense for tourists. The itineraries are designed so that they offer our customers a comprehensive but not exhausting tour of the best Jordan has to offer. Jordan Express, the best way to visit Petra in a short three day trip. Royal Jordan, a more traditional “five night” package covering a wider variety of Jordan’s cultural riches. As with any other destination we offer from Cyprus, we can build a tailor made Jordan vacation package just for you according to any preferences or requirements you might have. Call us at +357 22680500 or email us for more information on our tours. Located in Western Jordan, Mount Nebo tops at an attitude of a little over 800 meters and affords panoramic views of the Holy Land and the river Jordan. According to the Old Testament this is the place Moses first saw the promised land from. It is considered to be Jordan’s most revered site and tradition has it that Moses was also buried on this mountain, although the exact location has never been confirmed. A fourth century church and monastery foundation established by St. Helena sit on the highest point of Mount Nebo. The late Pope John Pope the II stopped at this Holy site during visit in 2000. 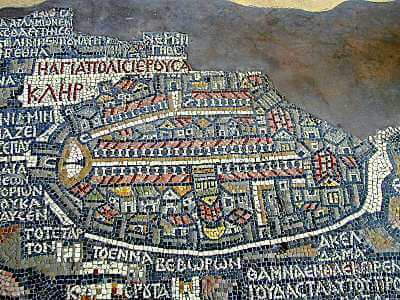 An exquisite array of decorative mosaics and carvings can be seen in the Madaba area with the highlight being the wonderfully vivid Byzantine era sixth century map of the Holy Land located at the Greek Orthodox church of Saint George. Located in the heart of the Jordan valley the shoreline around the Dead Sea is the lowest surface point on earth with the Jordan river replenishing its water. Not surprising, the Dead Sea is where the biblical Sodom and Gomorrah along with three other Biblical cities are thought to have been located. It is more than 400 meters below sea level and its water contains about 33% salt, about four times more than most seas or oceans. The high salt content gives a particular buoyancy to all objects in it. 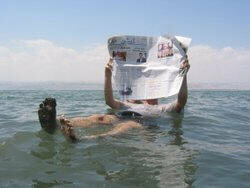 It is actually a lot of fun floating on the Dead Sea and reading a paper. In the last few years the medicinal effects of the Dead Sea’s surrounding atmosphere and the particular water composition have given a boost to spa tourism in the area with many grand hotel opening up around its shores. Kerak (or Al Karak), has been inhabited since at least the Iron Age, and was an important city for the Moabites and the Nabateans. In the Bible it is called Qer Harreseth, and the Romans conquered it from the Nabateans in 105 AD. During the late Hellenistic Period, Al Karak became an important town that was known as Kharkha. Under the Byzantine Empire it was a bishopric—containing the much venerated Church of Nazareth—and remained predominantly Christian under Arab rule. Kerak, once a part of the Kingdom of Jerusalem, lies to the south of Amman on the King’s Highway. The castle is situated on a hilltop at an attitude of 1000 meters and overlooks a valley on three sides. Kerak commands a magnificent view of the Dead Sea. A city of about 200,000 people has been built up around the castle. Construction of the Crusader castle began around 1140 A.D. The Crusaders called it Crac des Moabites. The most notable Crusader architectural feature surviving is the north wall of the fort, into which are built immense arched halls on two levels. These were used for living quarters and stables, but also served as a fighting gallery overlooking the castle approach and for shelter against missiles from siege engines. The “red rose city, half as old as time” is the well deserved reason most people decide to visit Jordan. The descriptions of Strabo, Pliny the Elder, and other writers identify Petra as the capital of the Nabataeans and the centre of their camel caravan trade. Walled in by impressive towering rocks and watered by a round the year stream, Petra not only possessed the advantages of a fortress but controlled the main commercial routes which passed through it to Gaza in the west, to Bosra and Damascus in the north, to Aqaba on the Red Sea, and across the desert to the Persian Gulf. Petra was declared by UNESCO a World Heritage Site in 1985 on the basis of both artistic and early technological innovation. It was also voted as one of the seven new wonders of the world in 2007. Recent excavations have shown that it was the ability of the Nabateans to control the precious water supply that led to the rise of the desert city, in effect, creating an artificial oasis. The area is visited by flash floods and archaeological evidence demonstrates the Nabateans controlled these floods by the ingenious use of dams, cisterns and water conduits. Thus, stored water could be employed even during prolonged periods of drought, and the city prospered by selling this precious commodity. The most popular tourist entrance from the east of Petra leads steeply down through a dark and narrow mile long gorge (in places only three meters wide) called the Siq (the shaft), a natural geological feature formed from a deep split in the sandstone rocks and serving as a waterway leading into Wadi Mousa. At the end of the narrow gorge stands Petra’s most elaborate and famous ruin, Al Khazneh (the Treasury) chiseled directly out of the red colored sandstone cliff. A little farther on from the Treasury, at the foot of the mountain called en-Nejr is a huge theater overlooking the resting places of generations of Nabateans. Almost enclosing Petra on three sides are rose-colored mountain walls, divided into groups by deep fissures, and lined with towers cut from the rock. Please note that a day in Petra requires quite a bit of walking. Estimate a walk of about five kilometers with quite a bit in exposed sun. It is advised you wear comfortable shoes, take a hat with you and carry some water. Jerash is situated in the northern territories of Jordan not far from the border with Syria and 45 Km north of the capital Amman. Jerash was known in ancient times as Gerasa and is considered as one of the most important and best preserved Roman cities in the Near East. 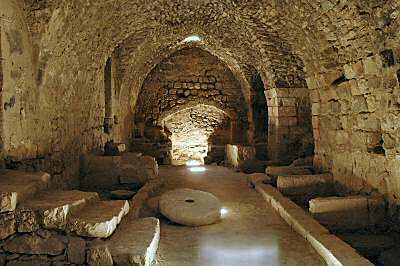 It was one of the ten cities of the Decapolis. 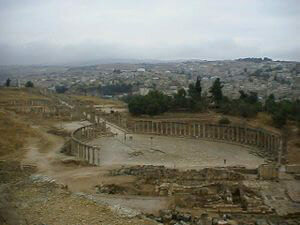 Recent excavations demonstrated that Jerash was probably first inhabited during the Bronze Age. After the Roman conquest in 63 BC, Jerash and the territory surrounding it were incorporated into the Roman province of Syria, and later joined to the Decapolis. In 90 AD, Jerash was annexed by the Roman province of Arabia, which included the city of Philadelphia (modern day Amman). The Romans enforced their Pax Romana in this area which enabled its people to devote their efforts and time to economic development and building activity. At its peak the city finally reached a size of roughly one square kilometer within its walls. The Persian invasion in 614 AD caused the rapid decline of Jerash. However, the city continued to flourish during the Umayyad Period, as shown by recent excavations. In 746 AD, a major earthquake destroyed much of Jerash and its surroundings. During the period of the Crusades, some of the monuments were converted to fortresses including the Temple of Artemis. Small settlements continued in Jerash during the Ayyubid, Mameluk and Ottoman periods. In 1878, Circassians settled in the town after immigrating from their homeland in Central Asia. Excavation and restoration of Jerash has been almost continuous since the 1920s. There are a large number of striking monuments located in Jerash: Hadrian’s Arch, a hippodrome, two immense temples (to Zeus and Artemis), the nearly unique oval Forum which is surrounded by a fine colonnade, a long colonnaded street, two theatres (the Large South Theatre and smaller North Theatre), two baths, a scatter of small temples and an almost complete circuit of city walls. Most of these monuments were built by donations of the city’s wealthy citizens. From AD 350, a large Christian community lived in Jerash, and between 400-600 AD, more than thirteen churches were built, many with superb mosaic floors. A cathedral was built in the fourth century A.D.
Today the archeological site of Jerash is thoroughly excavated and excellently preserved. 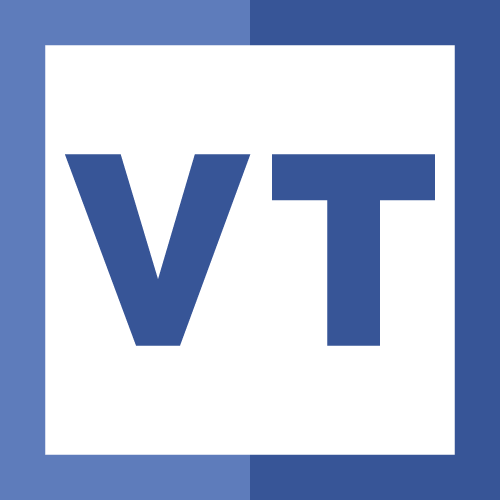 A visit to this site is highly recommended.